The history and terror of black slavery has been well documented in literature and film. Lawrence Hill's new book doesn't lessen the awfulness of the times, but adds a unique human dimension. Hill has created an uplifting and highly educational story about a shameful part of history. The Book of Negroes is sold in the United States under the title, Someone Knows My Name. Aminata Diallo was born free in Africa in the eighteenth century. She had a rich and lovely childhood until the day she was captured by slave traders and marched off to the coast in chains. Along with thousands of others, Aminata was destined for North America as a slave to white owners. She was eleven years old. Hill tracks Aminata's story through the circle of her life. 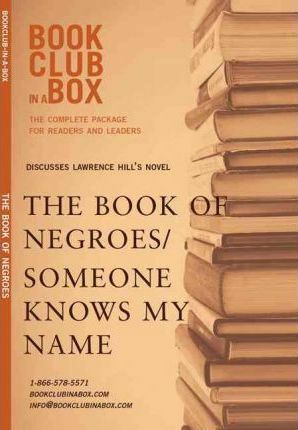 Every Bookclub-in-a-Box discussion guide includes complete coverage of the themes and symbols, writing style, and interesting background information on the novel and the author. Marilyn Herbert, the creator of Bookclub-in-a-Box, is a teacher, librarian, speaker, and writer. Bookclub-in-a-Box has over forty published discussion guides for contemporary fiction. They are ideal for book club members, teachers, students, and all readers.